Prof.Dr. Filip Vermeylen (PhD. Columbia University 2002) is Professor of Global Art Markets at the Erasmus University Rotterdam in The Netherlands. 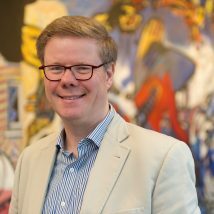 He lectures and publishes on various aspects of the economics of art and culture, and is currently the chair of the Department of Arts and Culture Studies. He is especially interested in the history and functioning of art markets since the Renaissance, the notion of quality in the visual arts, the role of intermediaries as arbiters of taste and emerging art markets such as India.